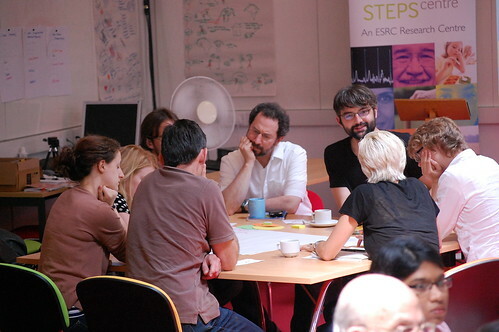 Participants in the recent STEPS Summer School came to Brighton from all around the world, bringing diverse life experiences and disciplinary perspectives together to learn about, discuss and debate new approaches to research for sustainability. Much of our discussion focused on the importance of encompassing plurality and diversity in both research and policy processes, and being alert to different framings of any given issue, particularly more marginalised ones. This got me thinking that it would be interesting to apply these ideas to ourselves (the group of participants at the summer school), and explore the range of perspectives within our group about the activity we are all involved in, namely: carrying out research for sustainability. At the same time it seemed like a good opportunity to illustrate one of the methods that had been highlighted earlier in the week as a potentially useful tool for ‘opening up’ policy to a more diverse range of concerns and discourses, ‘Q method’. So, on something of a whim, I volunteered to carry out a Q study with the group and present the results back at the end of the week in a mini-conference organised by the participants. Carrying out a Q study in 3 days was a little experimental for me, and I wasn’t even sure it would work: would our views be different enough to reveal anything interesting? Or would the fact we’d all just participated in the same two weeks of talks mean that we’d all just ‘regurgitate’ perhaps unconsciously what we had been hearing over the summer school?! In the end, thanks to everyone’s enthusiastic participation and critical engagement with the exercise, it was a lot of fun, and revealed some interesting things about the diversity within our group despite the fact that we are all ostensibly involved in a similar endeavour. I’ll give a brief background to the method before I describe the results. Q has a long history (it was developed by the psychologist William Stevenson in the 1930’s), and in recent years has found favour with a wide variety of researchers from different disciplines (from geography and political ecology to psychology and nursing) who share an interest in exploring different perspectives or framings, or in eliciting minority or marginalised discourses. In short, the method involves a researcher collecting a number of opinion statements about a given topic and asking a group of participants to sort them onto a scale (e.g. -4 to +4) according to how much or how little they are like their opinions. The resulting sort patterns are then statistically analysed to see whether particular groups of people sort the statements in similar ways. 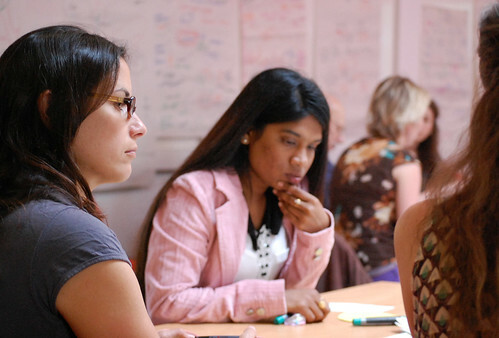 Resulting clusters of sort patterns (or ‘factors’) represent more or less shared points of view within the participant group and can be interpreted (usually with the aid of additional comments from participants) and written up as narratives. It’s a ‘small n’ method (generally carried out with a purposive sample of between 20 – 40 participants), so despite its statistical underpinnings, it is also highly interpretative, and lends itself to combination with a variety of other methods both quantitative and qualitative. The first step in any Q study is defining the area you are interested in exploring. In this case the topic of interest was the diversity of answers to the question: ‘what is research for sustainability?’ The summer school attendees were all asked to contribute one statement about research for sustainability with which they agreed, and one with which they disagreed. This generated around 70 statements (to which I added a few more into the mix, based on notes I had scribbled down during sessions with different speakers throughout the week, or questions or comments made by different participants).These statements were then narrowed down to a manageable number, the ‘Q sample’ (in this case 34 statements) which members of the group were asked to sort onto a ‘quasi-normal’ distribution shape from -4 to +4 according to how much or how little they were like their opinion. 26 people (including myself) carried out Q sorts, and the results were then statistically analysed for patterns using the free software, PQMethod. Deciding on the number of factors (or perspectives) to extract is a matter of judgement as much as mathematics, and depends to a large extent what you are interested in finding out from your data. In this case since I was interested in shared perspectives, I decided that only those factors with which at least two individuals were associated would be extracted and considered. Using this criterion, 4 distinct factors emerged from the sorting patterns, with one further factor that was ‘bi-polar’ i.e. two people who sorted the statements in almost opposite ways. So what came out, and what could it tell us about the diverse group of participants at the summer school? With more time to analyse the results one could try to draft short narrative descriptions of the different perspectives, but in this case I’ll simply point to some of the areas of similarity and difference revealed by the study, and flag up some questions about particular statements that might serve as useful starting points if one were to interrogate the data further. The original statements that participants were asked to sort are listed in the table below. In the table above, the statements at the top are the ones where there is a high degree of consensus between the viewpoints (i.e. the statements that were sorted in more similar ways by the group); those at the bottom are those with which there was greater levels of disagreement. Below are my thoughts on the answers to some key questions asked. The numbers in brackets are the hypothetical score that each of the idealised perspectives or ‘factors’ would have awarded this statement in terms of the original distribution -4 to +4). 19 out of the 26 participants loaded on just one factor, while seven people’s views were either split between two or more factors, or didn’t load on any. Factor 1 was dominant, with eight people sharing this point of view to a greater or lesser extent, while four people loaded on factor 2, three people loaded on factor 3, two on factor 4 (and one positively and one negatively on factor 5). What might this ambivalence stem from? Is this perhaps an allusion to tensions between calls for all research to make itself above all ‘policy relevant’, and the need for more critical perspectives? Or perhaps our group felt that ‘impact’ was too broad and vague a term? This shared disagreement seems to echo debates that occurred earlier on in the summer school about the political implications of a global framing of the environment as a ‘life support’, and questions raised by various group members about whose views and needs might be disregarded under this framing of the problem. But this statement also engages with the idea that it is possible to judge different pathways (‘elaborate their merits…’), pointing to the shared perception in the group of the existence of a normative framework for doing so that exists beyond the framings of the research subjects, and acts to prevent the prevent the researcher becoming paralysed by relativistic tendencies. Exactly what this normative framework might look like might be the subject of another Q study! The question then becomes – how does a researcher make the call to advocate or not on behalf of those they are studying? Does the disagreement expressed by factors 1, 2, 3 and 5 with this statement suggest a view of scienc e in which norms and biases are inevitable? Or is what is emerging here about differing understandings about the normativity inherent in the idea of sustainability? Would this statement have been sorted differently had it just been about ‘doing good science’ rather than ‘good science for sustainability’? Factor 3 and 5 in particular appear to express greater agreement than the others with this statement, while factor 2 appears most negative about this issue. When read alongside the negative scores awarded to statement 13 (that the environment should be prioritised as it is everyone’s life support), the difficulty with either absolute position becomes clear, and as a group we appear uncomfortable and divided about the radically relativist position implied by statement 12, and yet largely against a purely absolutist global framing such as apparent in statement 13. This was disagreed with strongly by all but one factor. If interrogating the data further, it might be interesting to ask whose views were represented by this factor, and why this might be. Does disagreement about this statement imply a difference of opinion about the extent to which research for sustainability is about ethics per se? Factor 2 and factor 5 in particular disagree with this statement. We might compare this to the sorting pattern for other questions to try and understand why this is. For example, factor 5 responded positively to statement 28 and negatively to statement 19 – does this suggest that this view is uncomfortable with seeing research for sustainability in terms of ethics, and challenging power, preferring to focus on the role of the researcher as building up knowledge about the world? So there it is. Even among a group of researchers with many shared ideals and commitments to the idea of carrying out ‘research for sustainability’, a group who had spent two weeks listening to the same talks and taking part in the same debates, there was a diversity of perspectives. Different views about the ethical and political dimensions of the idea of sustainability, different emphases on the purposes or ideal outcomes of research, different ways in which people negotiate the difficult terrain between commitment to a personal set of ideals and normative values, and an appreciation of the need for research to reveal diversity, and sometimes conflicting voices. Whatever else we might learn from exploring the particular differences between members of our group in this way, hopefully the exercise served to remind us all that there is no single unassailably ‘right’ perspective about research for sustainability. We all have to situate ourselves in this critical and contested field through ongoing processes of engagement with difficult debates, trying as best we can to avoid being too contradictory in our positions, and keeping at the forefront of our minds the importance of reflexivity. Thanks a lot to everyone who took part!